LS116 was built by the Dry-dock & Machine Company in Charleston, SC in 1929. The contract price was $274,434. The LS116 was launched on October 22, 1929 and completed fitting out by August 14, 1930. She was considered "the finest afloat". She was driven by diesel electric propulsion, with one 350 h.p. electric motor turned by any one or all four Winton 75-kw diesel engine/generator units. Top speed of 10 knots came from the 5.9 feet dianeter propeller. Fuel oil capacity was 24,000 gallons. The engine deck could produce a total of 400,000 watts DC - that's enough to light 4,000 100-watt bulbs! The Chesapeake was initially fitted with a submarine fog bell. It was changed to a two-tone diaphone in 1935. The main lights were shown from two 375mm electric lens lanterns, one on each mast. The LS116 was built for crew comforts. There were three toilet compartments, each with its own shower. A water distiller on the upper engine room catwalk converted seawater for use in these areas. She carried 10,000 gallons of drinking water in tanks. The galley stove initially ran off heating oil but was eventually replaced by an Akron Electric Company stove. The Chesapeake had a crew of 16, including a cook. There were four or five men ashore at any one time. Crews served two months aboard, one ashore. 500 pounds of ice were brought out by tender vessel very month for the big ice box on the Chesapeake. It would last about two weeks. LS116 career details were Chesapeake, Virginia (1933-1942); as an examination vessell off Sandwich, Massachusetts during the Second World War (1942-1945) when she was armed with two rapid fire 20mm guns for her patrols near the Cape Cod Canal; Chesapeake (1945-1965); Delaware (1965-1970). LS116 was re-designated WAL 538 by the Coast Guard and was retired from active duty August 25, 1970. She was decommissioned on January 6, 1971. Later that year the ship was transferred to the National Park Service and used as a floating environmental classroom at Hains Point, Washington DC until 1980. In June 1981 the Mayor of Baltimore accepted the lightship on behalf of the city and she was socked at Pier IV on Pratt Street. 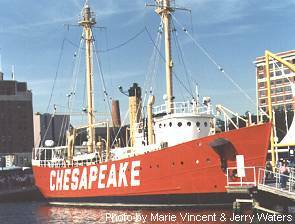 The Baltimore Maritime Museum has posted a short history of the lightship. The lightship is open daily, along with Seven Foot Knoll Lighthouse, spring to fall and Friday to Sunday in winter (museum admission fee). FOOTNOTE: The lightship designation WAL meant W - Coast Guard; A - Auxiliary; L - Light. The Designation WLV meant W - Coast Guard; L- Light; V - Vessel. Take I-95 South to Baltimore. Exit at Eastern Ave and travel West. Go all the way to the end of Eastern Ave., cross President Street. The Taney is on the right. There are several parking garages & lots in the area. Take I-95 North to Baltimore. Take Exit 53, marked Downtown I-395 N. Take the left fork (downtown) and stay in the center lane (becomes Howard Street). Keep straight. You will pass Ravens' Stadium and Oriole Park at Camden Yards on your left. Make right onto Pratt Street (third traffic light). Proceed past Harbor Place and ESPN Zone to President Street and make right. Make another right on Eastern Ave. The Taney is on the right. There are several parking garages & lots in the area.